It’s Monday and we’re going meatless. 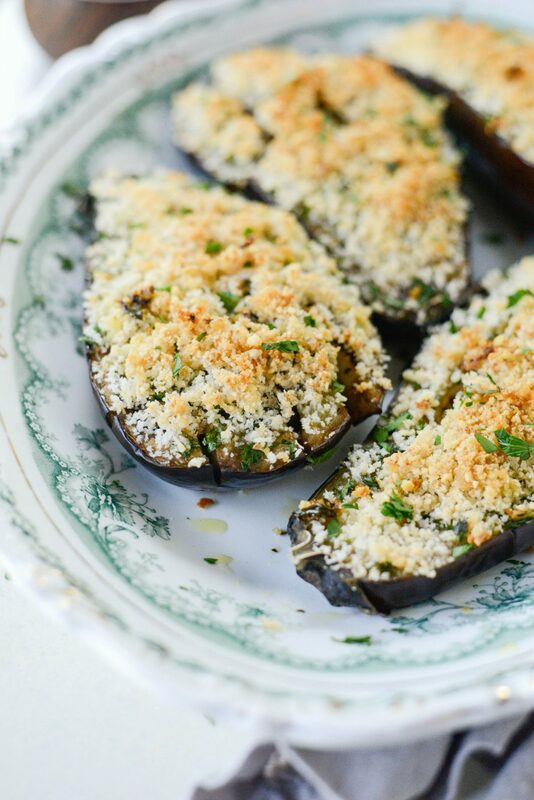 Enter Baked Eggplant with Pecorino Crumbs! In a perfect world my family would be down with the whole #MeatlessMonday movement. The reality of my life is that they are not and if eggplant is involved, I can just forget about it. Me on the other hand, I LOVE a good meatless recipe. Mushroom burgers, cauliflower steaks and all the eggplant. 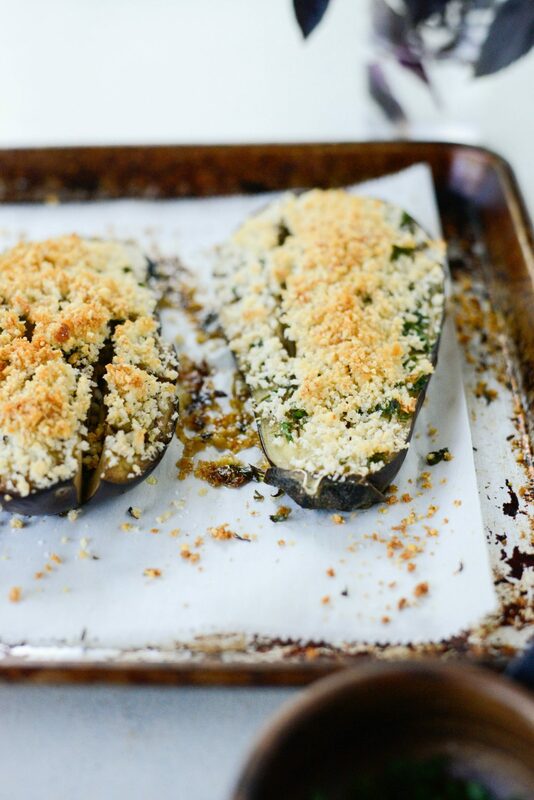 This baked eggplant recipe was inspired by my grilled zucchini recipe that I shared over the summer. While I was grilling the zucchini, I thought baking eggplant in a similar way would be great fall meatless main dish. With this eggplant recipe I followed a similar path. 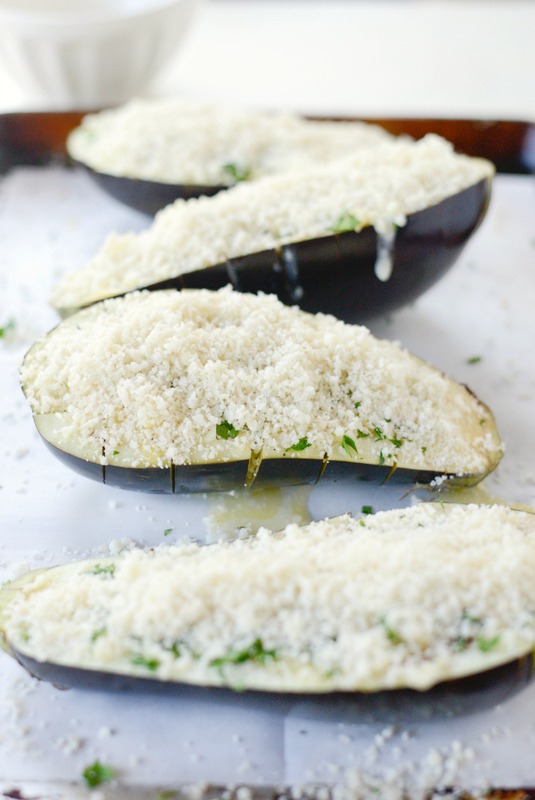 Making deeper checkerboard cuts into eggplant, drizzling with melted butter, garlic and topping it with a mixture of grated pecorino and panko breadcrumbs. It’s tender and with so much flavor, thanks to butter, garlic and herbs which contrasts nicely with the crispy, crunchy and cheesy breadcrumbs. Which, if you ask me, is the best of both worlds. 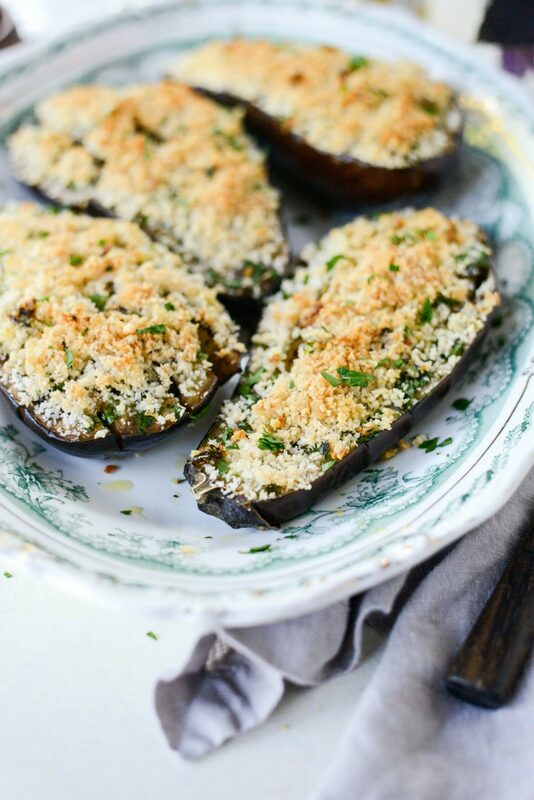 To start you’ll need a couple washed eggplant, melted butter, garlic, s & p, parsley and/or fresh basil, breadcrumbs (use your favorite! ), Pecorino Romano cheese and olive oil. 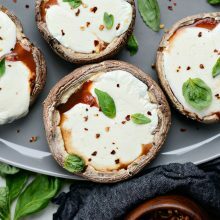 If you can’t find or don’t want to use Pecorino, then try this recipe using Parmesan cheese instead. 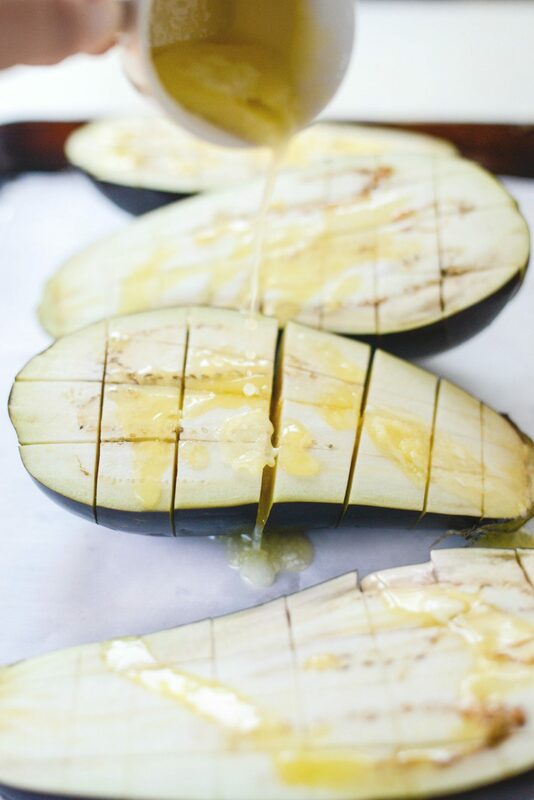 Start by cutting your eggplant in half. Then make crisscross or checkerboard-like cuts two-thirds of the way through. Do your best not going all the way through the skin of the eggplant. Then drizzle or brush each halve with 2 tablespoons melted butter. If you’re worried about the garlic flavor being a little too intense, sauté the garlic in with the butter for 1 to 2 minutes on medium-low heat, then brush or pour it over top. Next, sprinkle with minced garlic, parsley and salt and pepper to taste. Then, try to work the garlic and parsley into the cuts. 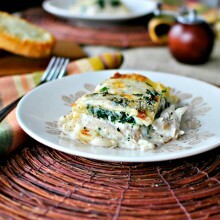 This recipe is superb with basil too! I had plans to do a mix of basil and parsley, but when I checked my basil plant I found the leaves already starting to turn brown and curl. Meaning I couldn’t use it for this post. If you have fresh basil, I would use 2 tablespoons minced with 2 tablespoons minced parsley. Then in a small bowl combine 1/3 cup of the freshly grate pecorino and panko bread crumbs and sprinkle over top. 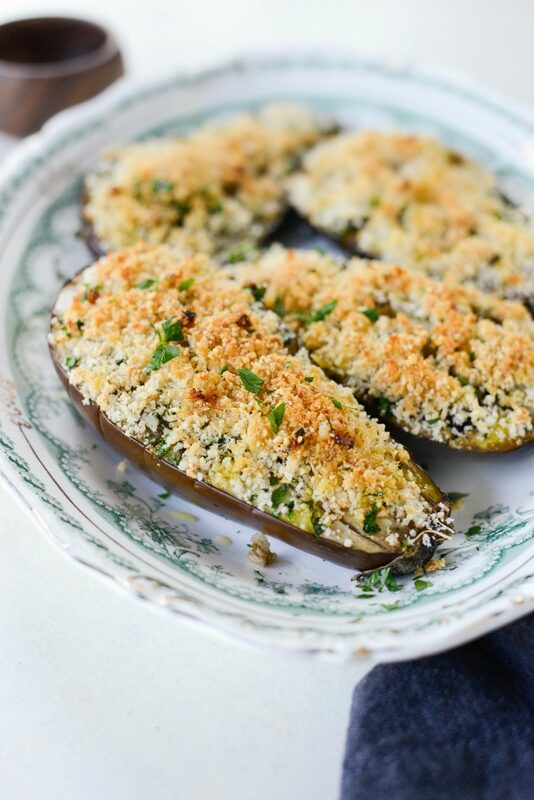 Drizzle with a little olive oil before sliding the eggplant into your preheated 350° oven for 30 to 40 minutes or until the eggplant is super tender and the breadcrumbs are golden. The baked eggplant should smell amazing and be slouching down towards the pan. The breadcrumbs golden and crisp. If desired, drizzle with a little bit more olive oil before serving. 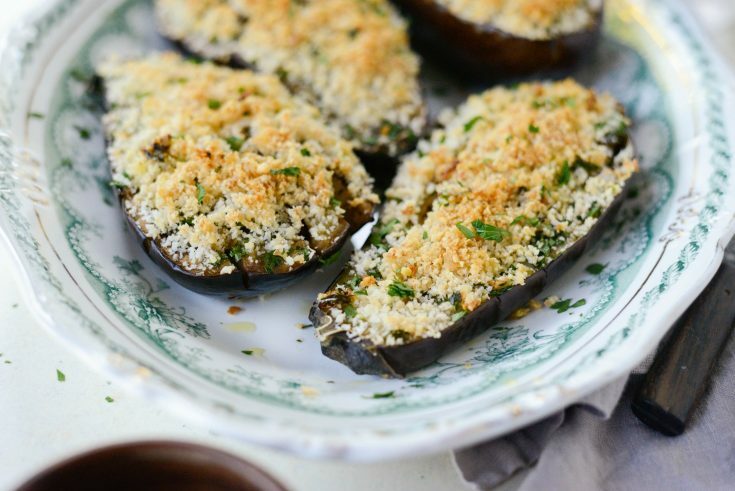 As the main dish, this baked eggplant is SO easy. 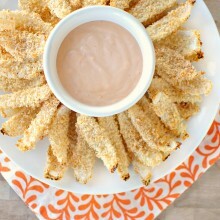 It’s perfect next to a salad, quinoa or a medley of roasted veggies. Enjoy! 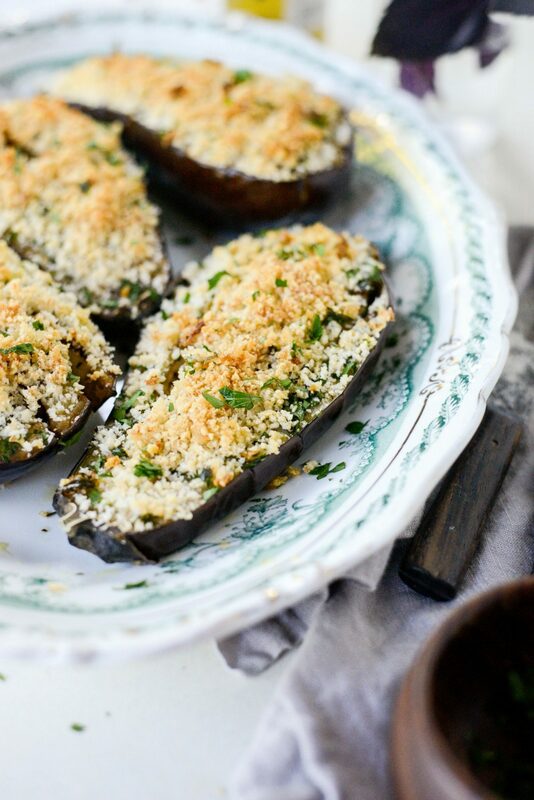 And if you give this Baked Eggplant with Pecorino Crumbs recipe a try, let me know! Snap a photo and tag me on twitter or instagram! 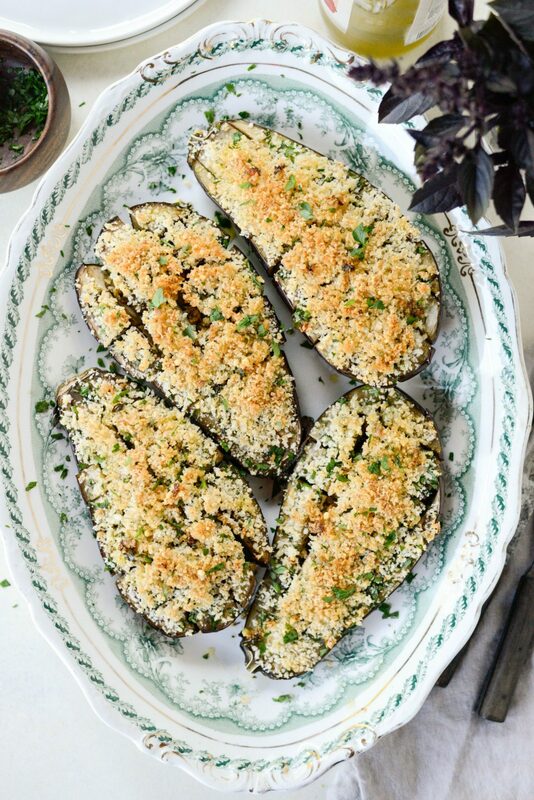 In this Baked Eggplant recipe, eggplant is halved, drizzled with butter, garlic, s&p, parsley and topped with grated pecorino and panko breadcrumbs. Preheat your oven to 350° and line a rimmed, metal sheet pan with parchment paper. Meanwhile, slice each eggplant half crosswise (like a checkerboard) 3/4 of the way deep, but not all the way through. Drizzle the melted butter over each eggplant half. Place the eggplant halves on prepared pan. 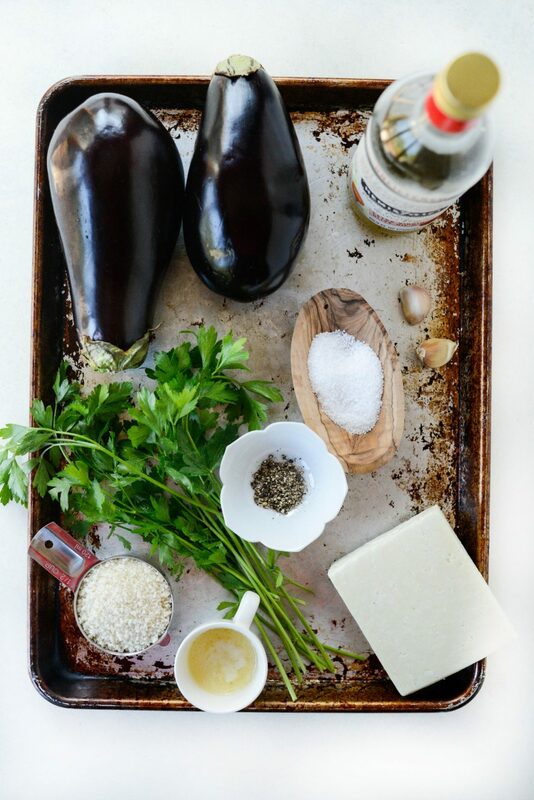 Work the minced garlic, basil and parsley into the cuts of the eggplant. Toss the breadcrumbs with the cheese and sprinkle it overtop. Drizzle the tops with olive oil. 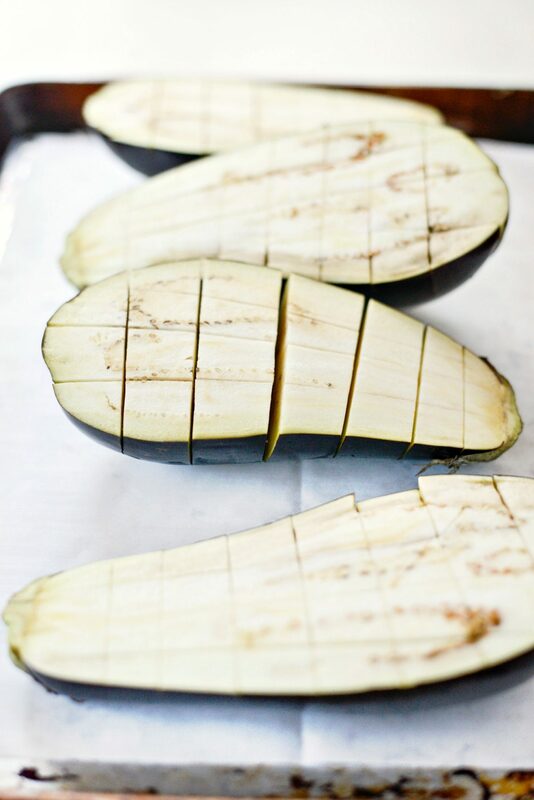 Bake the eggplants in your preheated oven for 30 to 40 minutes or until tender. Definitely trying this one. 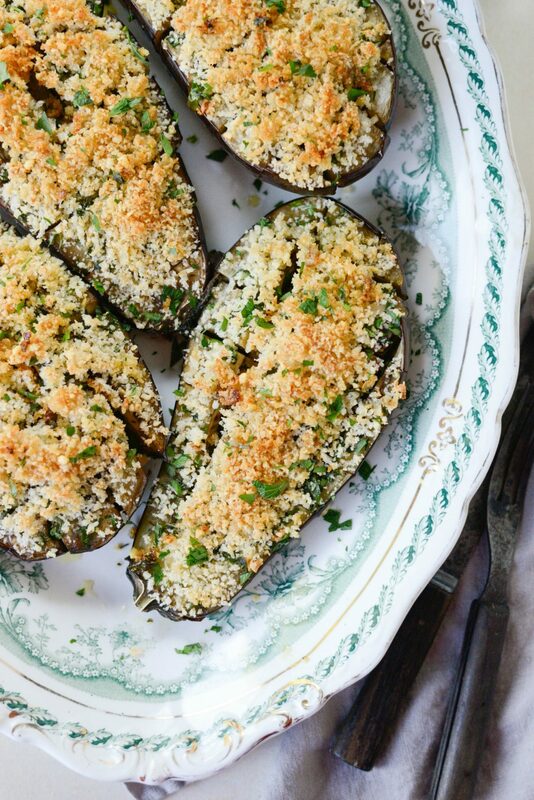 Eggplant, garlic, and cheese – perfect! I love eggplant, but I didn’t when I was younger. It’s odd how our tastes change! I was the same way, Rose! I hated it (along with most vegetables 😉 ) but now I love it! Enjoy! 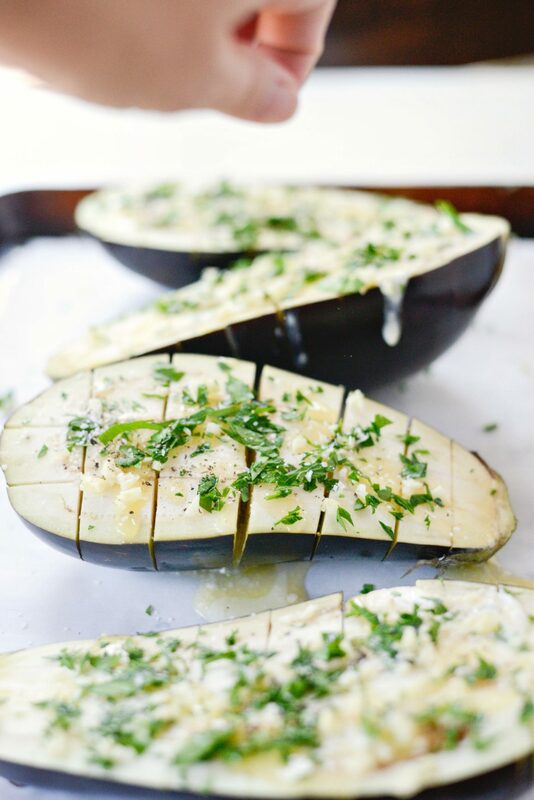 This is the first recipe I’ve seen that makes me want to try eggplant for the first time…I mean, garlic, butter, and cheese?!? How could it be bad? Can’t wait to try this!